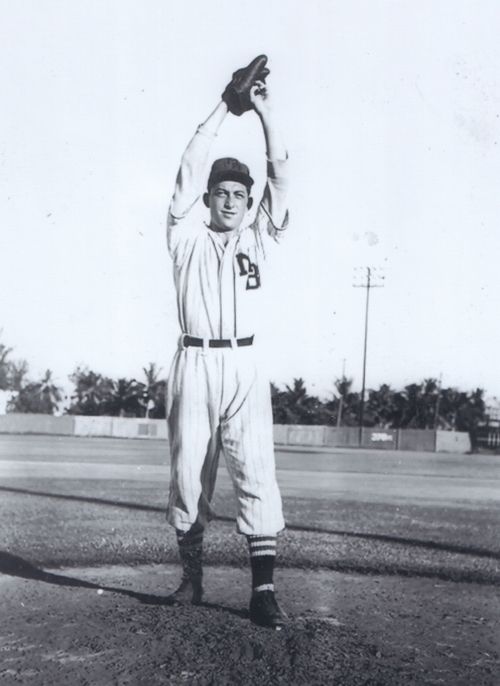 In just one season as a professional ballplayer, Milt Rosenstein was a 20-game winner, a circuit strike out leader and a star performer on a league championship team. The Flamingos had received interest in the young hurler from the New York Yankees and New York Giants, and, on December 5, 1941, it was announced that he had been purchased by the Atlanta Crackers, pennant winners of the Class A1 Southern Association, a team with whom the Flamingos had a working agreement. The 32nd Infantry Division landed at Leyte on November 14, and went into action along the Pinamopoan-Ormoc highway. Two days later they relieved the 24th Infantry Division at Breakneck Ridge and captured the town of Limon in bitter hand-to-hand combat against the Japanese. In his last letter home he wrote that he had just gotten out of sick bay and, "They wanted to send me home, but, I can't leave my buddies. We're so short handed. Please forgive me. I volunteered to stay". Milt Rosenstein’s body was returned home to Ellenville, New York in 1949. Services were held at the Hebrew Aid Synagogue on February 3, with Rabbi Jacob I. Nislick officiating. He was buried, with full military honors, at the Hebrew Aid Society Cemetery in nearby Wawarsing, New York. Thanks to Astrid van Erp and Justin Kodner for help with photos and information for this biography.